Gmünd students express dividends from RK Exhibition visit. 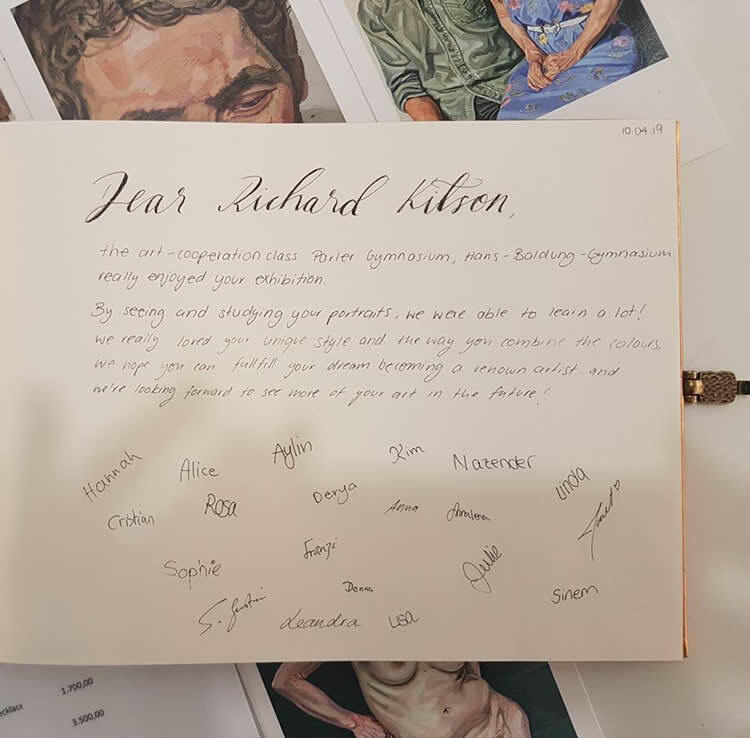 Richard Kitson was "really chuffed" to receive a specially signed message, written in English, from pupils of the art class of Hans Baldung Gymnasium following their visit to his exhibition in the Prediger in Gmünd. Richard sends back his grateful thanks to every one of them for their kind feedback. He is looking forward to returning to Gmünd for a whole week after easter to present his workshops to students at the art college in Gmund. Fruity Ale and Beer with Yorkshire Pride. "There's a right beer for every occasion, but not every beer fits every occasion." declared Armin Ruch last Tuesday evening at the first "British Ale Tasting" event in Gmünd. He went on to explain various types of beer and what the differences in taste are. Due to interest in 'ale' but also in the town twinning with Barnsley this proved a popular event, about two dozen visitors decended on the cinema pub KKF in Gmünd. It had been organised by the Association for Town Twinning in Gmünd, who also procured the beer. It came from a small brewery in Gmünd's English twin town Barnsley. 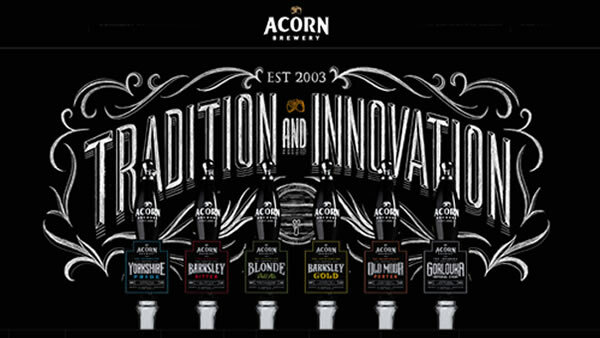 Acorn Brewery is a small, independent but hip brewery that still produces its beers in a manual process. "In former times 'ale' was brewed without hops, but "beer" with, explained Ruch " 'ale' was usually a top-fermented beer." The variety of English beers is almost as great as those in Germany and in order to get to know some of them this tasting evening was organised. The evening was primarily about ales but also about advertising for the town twinning with Barnsley. 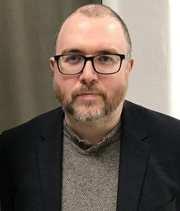 Robert Abzieher, deputy chairman of the Twin Town Association stated that Brexit had led to something of an awakening in England and it is precisely due to Brexit that a new awareness within the population for town twinning has arisen, for the importance of the connection between the citizens of the twinned towns. Barnsley is one of the places where new efforts are being made in order to strengthen the partnership with Gmünd, for example, a forthcoming event introducing people of Barnsley to German Easter traditions. 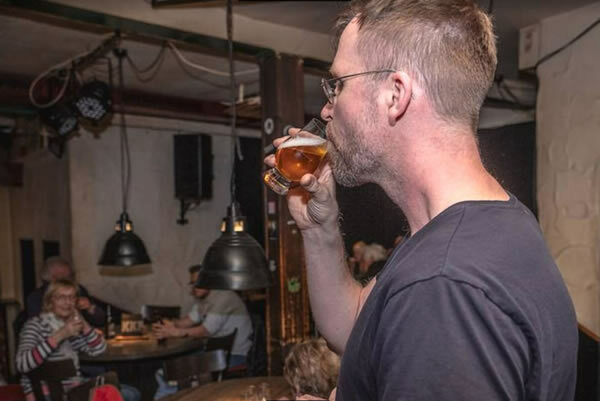 Armin Ruch has tasted numerous ales in the past and analysed their taste so he can now not only recognise the differences but is also able to describe them. 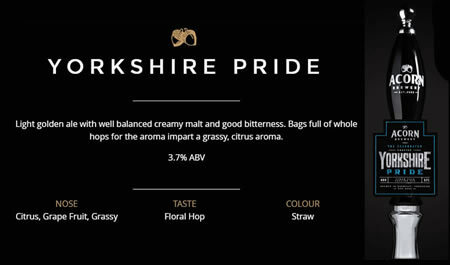 "In ales you can taste many different flavours, it's a bit like with wine," he eulogised "there is 'Yorkshire Pride' for example, which gives off a "nice note of honey." "Or the 'Indian Pale Ale' which goes back to Great Britain's colonial past, because it was intended for the British in India." he continued, "One problem that had to be solved at the time was the long transport routes. A lot of hops had to be used to ensure that the beer didn't go off during the voyage which resulted in the drink becoming bitter. What was needed were hop varieties which tasted less bitter and they were found by crossing German and American hops, producing a lighter ale. This, of course, changed the taste of the beer, and it now has a note of lemon and a mango-like flavour. "This ale tastes strikingly fruity" were Ruch's introductory words for the drink. Hanna had been drawn to attend the event at KKF because of her interest in town twinning but more importantly they were 'fans of the British pub' culture. Hanna regaled an anecdote from the past about the visit of the mother of an English friend of hers. During a visit to her grandchildren's school in Mutlangen, the mother gave a talk to the parents of other pupils about England and English customs. At the end she was asked "In England, does it get dark at night as early as it does here?" after short contemplation, "I don't know," she replied "I'm always in the pub at that time"! The first "British Ale Tasting" event in Gmünd was clearly a big success as all 280 bottles from the first of several deliveries of Barnsley's Acorn beer have been drunk. Cheers ! 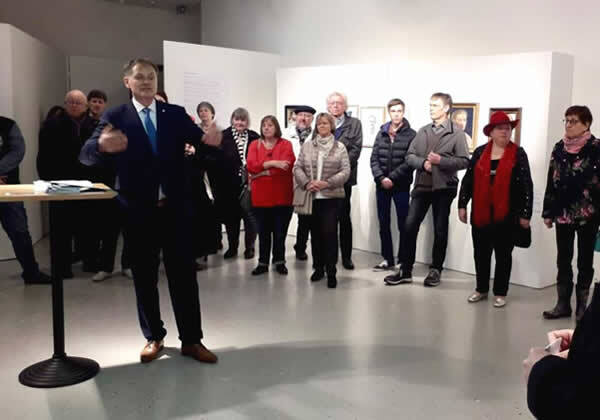 Richard Kitson: Portraits exhibition officially opened in Schwäbisch Gmünd. On Saturday 15th March, members of the Verein Städtepartnerschaft and the general public gathered in the Labor im Chor gallery within the Museum and Galerie im Prediger in Schwäbisch Gmünd to welcome Richard Kitson and witness the official opening by Oberbürgermeister Richard Arnold of the Richard Kitson: Portraits exhibition. It is the first international solo exhibition for Richard and also a first visit to Schwäbisch Gmünd but he will be back again in April when he will be running workshops with students from the art school. Richard's wife Joanne, together with her proud parents Mr and Mrs Kilner also accompanied Richard to offer moral support but are also very keen to discover the delights of Schwäbisch Gmünd and meet it's wonderful people during their visit. We wish them all a successful visit! The first book donation for the special book library is made. Members of Verein Städtepartnerschaft received their first English book in the Book Appeal for the re-installation of the English telephone box re-designed to house a special book library near the Barnsley Garden in Schwäbisch Gmünd. The idea is for it to exclusively house books with a direct connection to their twin towns Barnsley, Antibes, Bethlehem, Faenza and Szekesfehervar in English, French, Hungarian and Italian which can be read and borrowed by citizens and will, apart from general information on twinning, also contain books for children and young people in these languages. 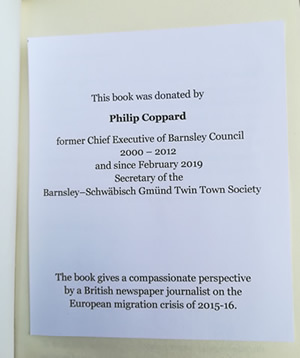 Complete with a personal dedication, Phil Coppard, Secretary of the BSGTTS made the book donation during a recent visit to Schwäbisch Gmünd for the International Guggen Festival. Town Twinning commitments - friendships will survive Brexit! Frumptarn Guggen Band banged the drum of friendship between the people of Barnsley and Schwäbisch Gmünd very loudly at the International Guggen Festival this weekend. For many years now they have been welcomed like brothers and sisters by both the large crowds and fellow Guggen band members from all over the world gathered at the festival. 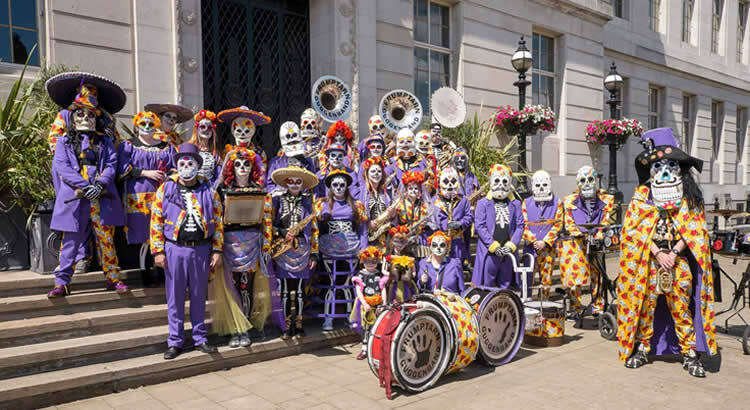 The 30 strong Frumptarn Guggen Band together with several of their own fans including Barnsley Mayor Steve Green and Mayoress Tracey Green travelled to the twin town. The party received an official reception with Oberbürgermeister Arnold where Honorary President of the twin town society in Schwäbisch Gmünd, Reinhard Kuhnert took the opportunity to pin a German-British badge on the Mayor's suit. The press in Schwäbisch Gmünd were very keenly interested to interview Mayor Steve Green and his wife Tracey about Brexit and any possible effect on the relationship between the two twin towns. Mayor Steve Green stated that connections should be strengthened and that he was convinced twinning would go from strength to strength, furthermore he himself wanted to contribute to this. He wanted to engage in the promotion of the friendship between the towns in Barnsley and motivate the citizens of Barnsley to visit Schwäbisch Gmünd. 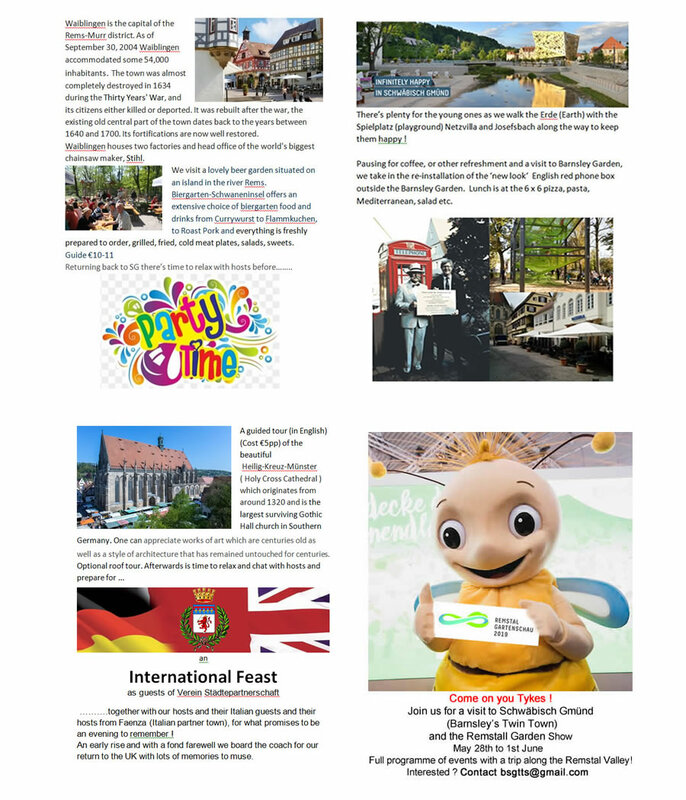 He wanted to see a more prominent and visible presence in Barnsley, for example ‘Remsi’ bee mascot on display in the town centre advertising the Garden Show and more news and information about Schwäbisch Gmünd in the Barnsley Chronicle. “Perhaps a miniature replica model of Schwäbisch Gmünd in the town centre would be a suitable symbol to mark the 50th anniversary of our town twinning in 2021” he suggested. Sir Stephen Houghton, Leader of the Council, also declared his commitment to twinning during a recent visit to Gmünd. He stressed that Barnsley took the twinning with Schwäbisch Gmünd very seriously and that in view of Great Britain leaving the EU, the strong bonds between the two towns had to be of heartfelt concern to all people responsible. 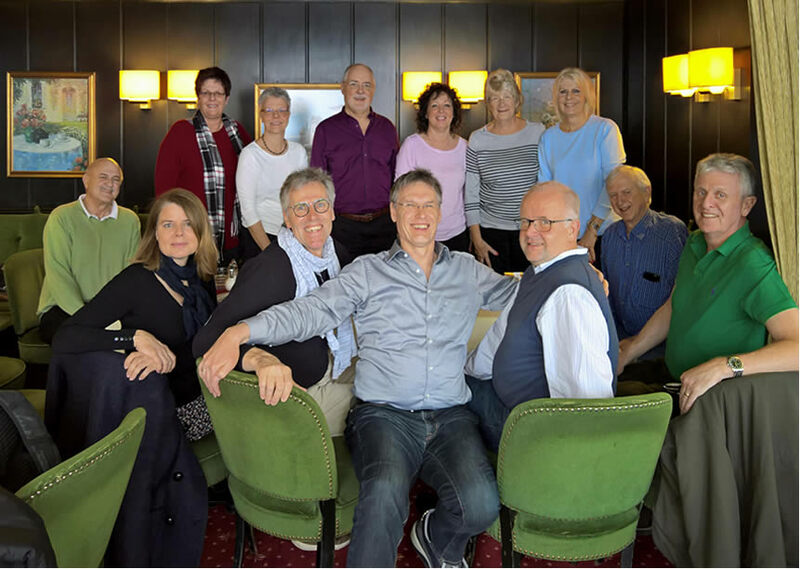 Members of Barnsley Schwäbisch Gmünd Society including Secretary Phil Coppard and his wife Ros, together with long standing member Pauline Sapsford paused from the “mad music” weekend for coffee at Cafe Margrit with officials from the twin town association in Gmünd. Our very own Frumptarn Guggenband is proud to be representing the UK in the 'Internationales Guggenmusiktreffen Festival' held every year in Barnsley's twin town of Schwäbisch Gmünd. "Naturally the band are delighted to be invited to this very prestigious event" explains Frumptarn President Craig Wolstenholm, "The festival features twenty guggen bands from all over the world including Switzerland, the Principality of Liechtenstein, Germany and the UK and involves over 800 musicians." The weekend event has become very popular, often now referred to by the locals as 'mad music' weekend attracts large audiences of around 10,000 people every year, all descending upon Schwäbisch Gmünd creating a unique and very vibrant and lively atmosphere! The band travel next week so we wish them a great 'mad' time in Schwäbisch Gmünd. A bit more support for Richard…………. Our Sixth Form Art tutor Richard Kitson is exhibiting his portraits in Barnsley's German twin town, Schwäbisch Gmünd, next month - we're sure he'll be a big hit! A special request has been received from Schwäbsich Gmünd headed by Dr. Lukas Amadeus Schachner, chairperson of the Verein Städtepartnerschaft. For decades there has been an English red phone box in Gmünd as a symbol of the twinning friendship with Barnsley. It is no longer used as a telephone but will be re-designed to house a library. 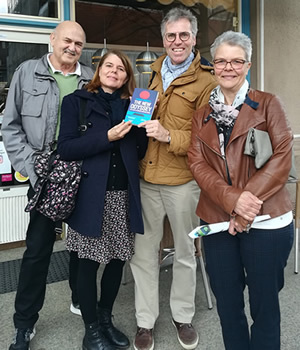 "The idea is to make available to the public, books from our twin towns in foreign languages" explains Lukas "the phone box hadn't been a present from the English twin town of Barnsley to the City of Schwäbsich Gmünd but to the Verein Städtepartnerschaft Schwäbsich Gmünd. It is currently being restored by the SG Works department and the Technical Academy with the agreement of the Verein Städtepartnerschaft to make it fit for its future use." 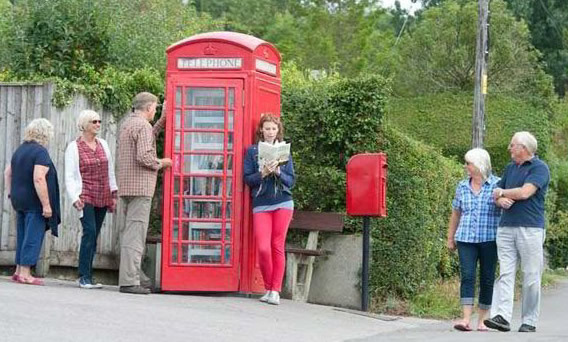 The English phone box will exclusively house books with a direct connection to their twin towns Barnsley, Antibes, Bethlehem, Faenza and Szekesfehervar in English, French, Hungarian and Italian which can be read and borrowed by citizens. Apart from general information on twinning it will also contain books for children and young people in these languages. Appeals for book donations have gone out to all twin towns. The Verein Städtepartnerschaft favours a re-installation near the Barnsley Garden and is currently appealing for 'Book Volunteers' in Schwäbsich Gmünd who would look after the books on a regular basis. "It would be nice to fill the phone box with books you'd like to share with us, it could be anything, novels, illustrated books, dictionaries, cook books, whatever you can think of" said Lukas, "each with a personal dedication to VSP and Gamundians interested in reading English literature. We would like you to ask those who might be able to donate used tomes and bring them with you when you visit in May, when the re-installation of the Library Phone Box will take place." SG Visit programme a real tempter ! (I promise !) .......so what more could you ask for? The whole experience begins with flights to Frankfurt on 28th May and for the next few days encompasses a full programme of events and sight seeing and also includes an official welcome by Oberbürgermeister (Lord Mayor) Richard Arnold and the re-installation of the English red phone box specially organised and gifted by the members of the Barnsley Society some years ago. Take a good look at the programme shown below ................ it's intentionally not too busy, to allow time to relax over a beer or wine, a coffee or ice cream and take in the atmosphere, reflect on the day and enjoy the whole experience. The opportunity to meet lovely people from Schwäbisch Gmünd is guaranteed, many of the over 300 members of the Verein Städtepartnerschaft there are eager to host and get to know people from their twin town in Barnsley. Friends from their twin town of Faenza in Italy will also be arriving at the same time as us, so it will be a truly international event to enjoy. If you like what you see and read below and would like to join us then please get in touch via our contact page for further information but don't delay as spaces are limited ! Sadness at the loss of a long standing member. 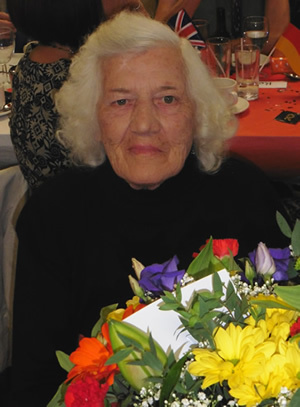 It is with great sadness that we have to report the passing of Olive Gaunt in the early hours of Saturday morning 19th January. Olive, a long standing member of our society was simply characterised as a very nice, gentle ‘lady,’ liked by everyone who she came into contact with. She never lost her farming background and often talked about her great love of ploughing competitions. "On behalf of our twin town society let me express my deep sympathy with you, our Barnsley friends and Olive's family. Olive was such a nice, warm-hearted 'lady' and I had the honour to enjoy her company for so many years. She had such a wonderful sense of humour, especially when discussing politics. It was in 2015 that she appeared all of sudden at our farewell evening, this was the place that I took the photograph shown here. Rudi and Marianne Pröbstle were her direct friends and partners whom Olive spent her days with while visiting them and Schwäbisch Gmünd. We send Professor Dr Reinhard Kuhnert – Honorary President of the Verein Städtepartnerschaft in Schwäbisch Gmünd our congratulations in celebration of his 80th Birthday. Many will know both he and his wife Adelheid had an "annus horribilis," suffering ill health but with the help of many doctoral visits and some 'TLC' along the way they are now well on the path to recovery even though they inform us they are continuously nursing and cultivating their indispositions. We send our best wishes to both and hope that God has great and pleasant plans for them to look forward to in their biblical years and beyond. 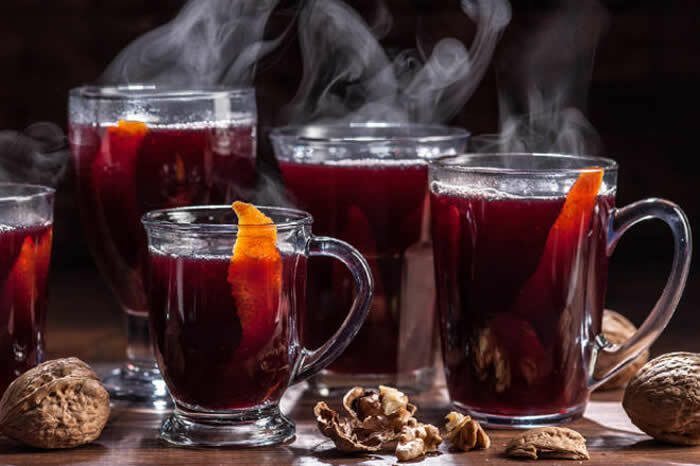 A nice warming glass of Hot Mulled Wine ! The society will have a stall at this year's Town Hall Open Day event on Saturday 1st December between 10am and 4pm. As well as an incredible light projection on the town hall, there will be a Christmas market, fantastic family entertainment, a range of food and drink stalls, choir singers, a big wheel and a family fun fair. Keep the kids busy for hours ! 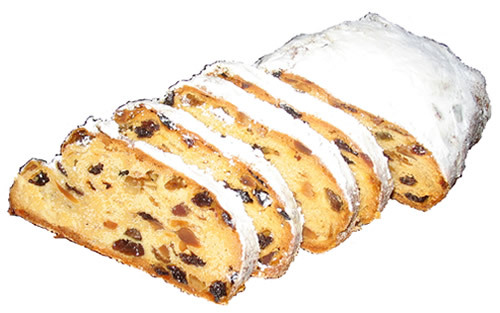 Our stall will be selling Gluhwein and Stollen with Orange juice and chocolate Santas for the children, just the thing in this freezing cold weather Brrrrr ! Come down and say Hello, we'd love to see you, one thing's for sure 'you'll get a warm welcome' ! German-English friendship strengthened through art, culture and joint football training. 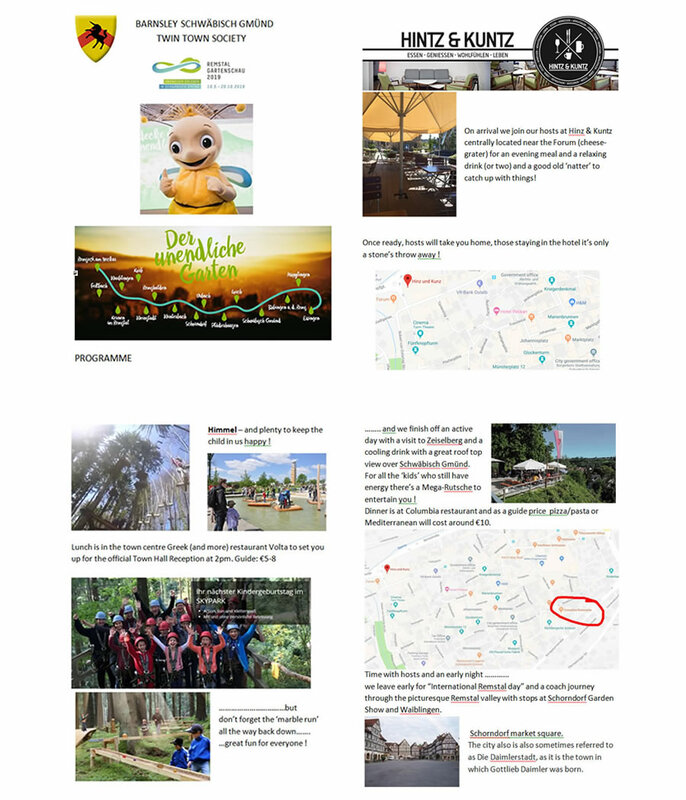 Thirty one members of the Verein Städtepartnerschaft in Schwäbisch Gmünd explored the country, people and way of living of their friends in the English twin town Barnsley. 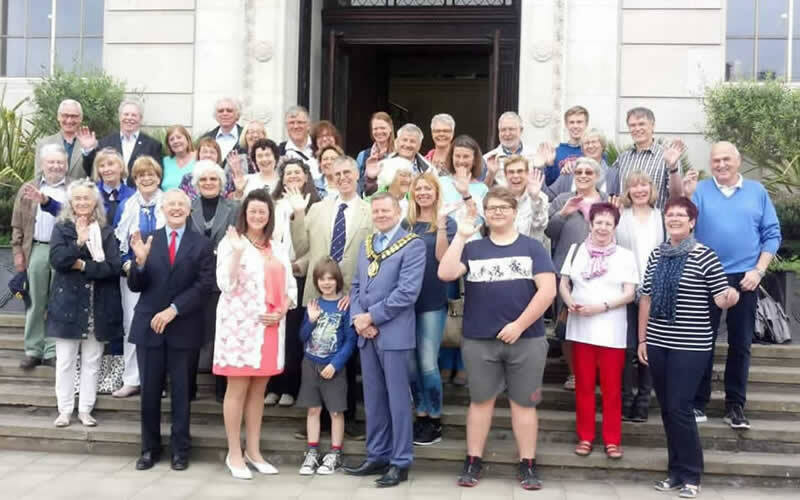 The topic of the one-week-long “Meeting people” trip was “Experience Barnsley” with the aim to meet with lots of people interested in town twinning and thereby revive the long relationship between the two towns. “Apart from the typical English hospitality Barnsley has a lot of exciting things to offer. The town is undergoing a transformation, architecturally and culturally” declared Dr Lukas Amadeus Schachner, Chairman and responsible for Barnsley. Together with his English counterpart they planned an attractive and extensive programme including receptions, talks, museum visits, meetings with artists, concerts, dinners, Fish’n Chips and parties at hosts’ houses. The youngest guests had the opportunity of experiencing a highly original side of Barnsley during a joint training session with English children at the Oakwell stadium , home of Barnsley FC. Lukas Schachner hopes that relationships will develop from meeting people which will be strengthened in 2019 in Gmünd. The efforts of the Verein Städtepartnerschaft complemented those of the town council which recently had been very cordially received by their counterparts in Barnsley. Bearing in mind the general political situation, the spirit of town twinning becomes just as important again as it was when these twinnings were first established, i.e. to build relationships between people on a private basis which will overcome any political and historical obstacles. Unbreakable and strong bonds between Barnsley and Schwäbisch Gmünd. A delegation with Oberbürgermeister Richard Arnold was very cordially received in Barnsley. They had been invited to the “Mayor Making” ceremony, the inauguration of the new mayor Steve Green. After the visit of the old and the new mayor of Barnsley to Schwäbisch Gmünd in mid-April this was an ideal opportunity to strengthen the newly revived bonds. During the festive and emotional ceremony the importance of the friendship between the two towns was high on the agenda. 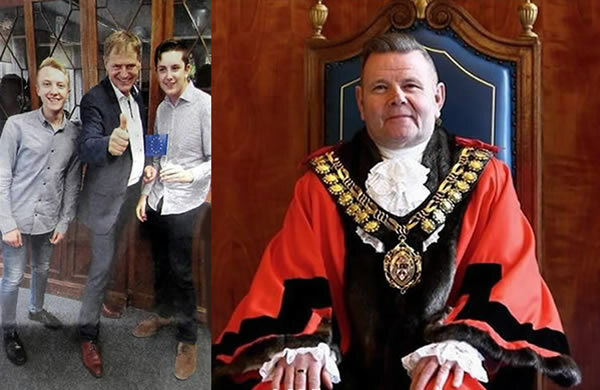 Richard Arnold and the councillors from Schwäbisch Gmünd were greeted as honorary guests, all speakers stressed the unbreakable and strong bonds between Barnsley and Schwäbisch Gmünd. Brexit or no Brexit, “We might be leaving the EU but we are not leaving Europe” became more or less the slogan for the talks with the guests from Schwäbisch Gmünd. Mayor Steve Green and Mayoress Tracey Green were pleased to share their inaugural day with their friends from Schwäbisch Gmünd and hope that the planned projects between them can be turned into reality soon. Sir Stephen Houghton, Leader of the Council, also declared his commitment to twinning during his speech which he mainly held in nearly error-free German. He stressed that Barnsley took the twinning with Schwäbisch Gmünd very seriously and that in view of Great Britain leaving the EU the strong bonds between the two towns had to be of heartfelt concern to all people responsible. During the two-day-trip to the English twin town Oberbürgermeister Richard Arnold, councillors Katharina Pfeifer (CDU), Gerhard Bucher (SPD), Gertraude von Streit (Greens) and Brigitte Abele (Citizens List) as well as the person responsible for town twinning, Katharina Aubele, learned a lot about the current redevelopment of Barnsley town centre. Similar to Schwäbisch Gmünd before the garden festival, Barnsley also sees the biggest redevelopment of its town centre in recent history. The towns are planning an exchange between experts in this area in order to share their knowledge and experience. Further projects discussed were a continuation of the exchanges between the Youth Councils as well as cooperation with the Barnsley Youth choir, one of the best in Europe.